Adrenals that are out of balance can lead to either high or low cortisol levels. High cortisol can result in insomnia, anxiety, sugar cravings, feeling tired but wired, increased belly fat, and bone loss. Low cortisol can cause chronic fatigue, low energy, food and sugar cravings, poor exercise tolerance or recovery, and low immune reserves. Out of balance adrenals can also lead to low or high DHEA levels. 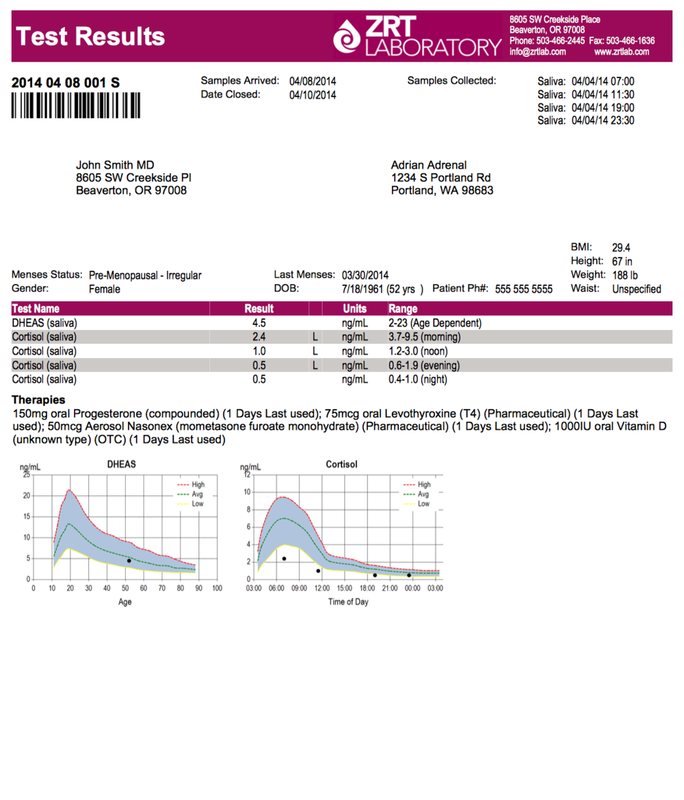 This profile test, from ZRT Laboratory, measures the adrenal hormones DHEA-S and diurnal cortisol. When athletes and active individuals experience continuous life, training, and nutritional stress, it can lead to changes in adrenal hormone level production which can be related to a wide range of health and performance issues including inflammation, cognitive dysfunction, bone, cardiovascular health, and immune system health, and blood sugar regulation, to name a few. We firmly believe in the saying, "test, don't guess". If you have been noticing any of these signs or symptoms, it may be a good idea to have an adrenal stress test done. Step 1: Purchase the adrenal stress testing below. Once we receive your payment, we will email you to collect your mailing address and you will be mailed the collection kit. This will include four plastic tubes that you will use to collect your saliva four times throughout one day. Step 2: Collect your saliva in the provided tubes. Step 3: After collecting your saliva, follow the instructions in the kit to seal and mail your samples to ZRT Laboratory for analysis. There is no cost in shipping your sample to the lab. Step 4: After about 5 - 7 days from the time the laboratory receives your sample, we will receive your results and will email them to you. Step 5: We will then schedule a 20 minute phone call with you to review your results.